The Minnesota Forecaster: Monday Storm Promises Precip -- How Much Will Be Snow? Wow, this appetizer to the storm produced 4+ inches this morning near the north I35 split. The NWS updated there weather story to include our Monday morning commute disaster at 5:22 am. No mention of this snow late last night. Two quick inches in Apple Valley this morning between 5 a.m. and 6:30 a.m. It was snowing at a pretty good clip. Just light snow now. WPC keeps the most aggressive forecast out there. Keeps most of the metro in the 6-9" range. Morning appetizer was strictly the east side of metro. This storm will be added to a long list of duds for the metro for the last couple of years. Jackpot for this storm is SW and Western MN, metro will be a side swipe effect! Nice sleet/drizzle coming down in Carver County for the past 3 hours after a dusting of morning snow. No clue where the snowstorm is. The meteorologists really should have watching the NAM model, as this shift to the west was in the cards from the earliest NAM runs. Doubtful the metro will see anything near what they are predicting. On 1500am, Dave Dahl just stated 3-7 more inches coming on top of 3 inches that fell this morning. Second round of snow arrives 4:00 - 4:30 pm. All told he is still at 6-10 inches for the metro though Tuesday morning. 3 inches in the eastern 2/3 of the metro. West of 169 got nothing. It does look like it's approaching now from the south though. This thing looks like it's going much farther west than forecasted. Am I seeing things? Based on the Mesoanalysis page at the Storm Prediction Center, and if it's right showing a strong negative tilt to the system from H300 down through H500, coupled with current radar returns, I believe Dave Dahl may be right. Where is this new snow supposed to be coming from? All I see is a big pocket of snow disappating to nothing coming up from the south. This storm is a dud, weak, sub par. But the biggest snow producer of the year. Pathetic!! Still staying warm while the snow falls. Novak talked about this last night with Bill and Paul Douglas alluded to it also. Just doesn't feel like that big of a storm, most of the ground was bare in Chanhassen at 4 PM. We may do a mid-event video update with Tom at 6. Any questions? Yes Bill - How can we make Anonymous trolls stop commenting on your blog? Curious as to how far west this thing shifted...and how did the forecasters miss the big snowburst this morning? We didn't get but a trace where I live, but the metro was a trainwreck during rush hour. Also, kudos to Novak for predicting the drizzle and mix this morning. It extended much further north and west than he expected, but he called it last night! Not being particularly sophisticated in these matters, I tried setting it up with various types of gatekeepers, but it seemed I ended up keeping out too many people. The easiest thing is for me to delete the whiny Anonymous comments that I think most of us don't care for. I'd also commend Novak talking very reasonably and level-headedly about how 8 inches could look like 4 pretty quick with melting, compacting, etc. It wasn't something I was hearing from a lot of mets. Others were pretty hype-driven. Even the NWS wasn't talking about it. But I'd still like to ask: it seemed to happen more than was expected. Was this in fact the case? And just like that the back edge of snow is going thru the metro, still underperforming system. I waited a little over an hour to respond, as I wanted to make sure that what I was seeing was real. The surface pivot point of this storm is now over north central Nebraska or maybe just east of there. With this storm taking on a negative tilt it would only make sense that returns would start to show up south and west of the metro as well, and indeed that is the case. This trend should continue most of the night. I'll take an underperforming snowstorm any old day, since I hate snow. But Tom Novak is pretty much the best meteorologist in the state. His forecasts are very insightful, very clear, and he just has a great demeanor. Keep up the good work Novak! 40's by the weekend. All snow gone! With such a dynamic storm as this, it is anybody's guess at EXACTLY how much snow is going to fall in the MSP metro when all is said & done. This storm is like a wheel & spokes where the center of the wheel is located near Pipestone, MN (sw corner). It will likely sit here & spin all night with spokes of energy riding north on the east side of this rotation. With that being said, predicting how much moisture each spoke of energy will have is nearly impossible. Throw in the likelihood of dynamic cooling & you get a forecasting nightmare when it comes to storm totals. Oh, & don't forget the 3"-4" that feel over the eastern 1/2 of the metro this AM; you must factor that in too. This is why we often need a wide range of snow totals over a relatively small area. I won't be surprised if some locales in the eastern metro report 8"+ while others report 5" or so. Enjoyed the video and the chance to watch another football game behind Bill. NWS is saying 2 - 4 overnight and under .5 Tuesday. We'll see what happens. Still 34 here. Thanks, Dave. Appreciate the feedback. Still going to get additional light snowfall with the low over the next 12 to 18 hours. The coldest air wraps around to the east side of the low which means the west side of the low is actually going to see warm air advection (lift). This was always going to be the quick 3 to 5 inches near the metro this evening with another 2 to 4 slowly dropping overnight and into tomorrow. Its also why the metro is under an advisory and not a warning. 6 inches over 24 hours is much different than 6 inches in 8 hours. Snow just about over in the metro. Not even 24 hour event when so many said a two day event with METRO totals approaching or in the range of 6,8, or 10 inches depending on who you like to listen to. So im sure people will throw out that folks on the east side reached 6", but that's a small sample. 3.8 officially at MSP. I know these storms are fickle and really hard to predict, but in light of what most were saying the day before the snow started falling, this was definitely a bust. 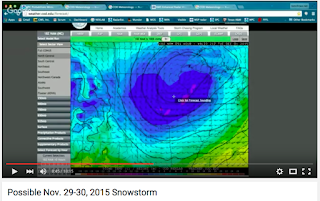 Tom Novak was definitely the closest on predictions, even though this storm barely scraped the bottom of the predictions. Good job Tom! One thing I've noticed is ever since the GFS model was updated last year, it hasn't come at all close to forecasting winter storms correctly. What are your thoughts? Novak's official metro forecast was 5-8", so if were grading he fell short, but so did many others, most notably Dave Dahl. Kudos goes to NWS for putting metro under an advisory and not a warning. Unfortunately, I must echo the sentiments that if this "snowstorm" wasn't a bust, it definitely under performed. Here in the Apple Valley/Rosemount area we picked up about 3.5 inches. Dave Dahl and many other meteorologists last evening were still calling for widespread 6 plus inches across the metro. They were also calling for an area of heavy snow to move through between midnight and 4 a.m. If those things happened, they didn't happen here. After 2-2.5 inches yesterday morning we picked up a quick inch or so around 6 p.m. That was it for this event, except for some light snow flurries. I have a bad feeling that this winter is going to be a long and depressing one for those of us who enjoy winter weather. I foresee a Denver-like winter with occasional cold days and snow that are quickly followed by warm and dry weather. Watch the snow disappear, just like is predicted later this week with highs around 40 degrees. What is the average high now for the metro, 26 degrees? Heck, it's a challenge to even get down to 26 degrees at night. We will have to wait to see if the early predictions for a strong La Nina next winter come true. That the storm was a bust is obvious. That this winter will be depressing for snow lovers is also obvious. But because of the above, we should be happy we got at least some sort of a snowstorm. It will be a rare occurrence this winter. I think high grades go to Jonathan Yuhas from KSTP. On Friday he was in the 2-5 inch range, downplaying the severity of the storm, talking about mostly wet roads, etc. And he stuck to his guns. I think he tweeted 3-6 yesterday midday, so came up a little bit, but overall he was the most level-headed forecaster I saw. Novak did well too. Dave Dahl and NWS get low grades in my opinion. Dahl especially was bad. He came in Sunday afternoon after Yuhas's great forecasting all weekend and just squashed it like a tiny bug, saying, "Storm's moving east! Gonna be huge! 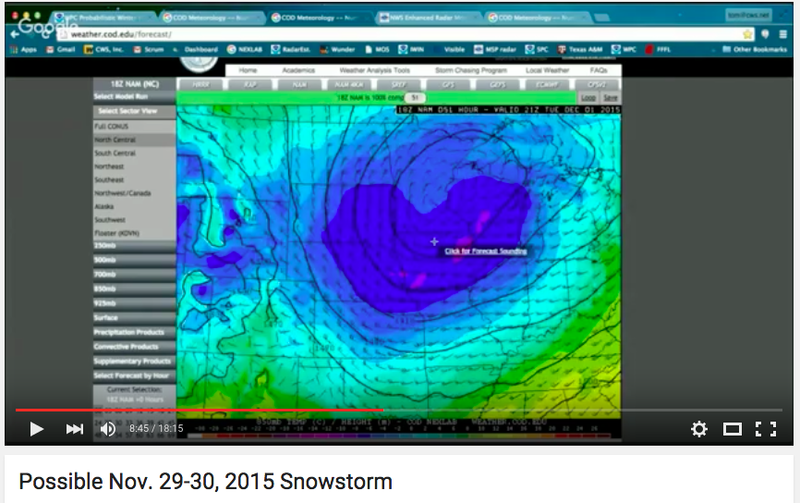 MSP likely in the bullseye, 8+!" Unbelievable. The deterioration of Dave Dahl's accuracy is an interesting thing. When I first moved to Minnesota 9 years ago, I started tracking forecasts by the various outlets for a couple of years and Dave Dahl was by far the most accurate. Then for some reason his accuracy started to tank dramatically. I think he started to 'sell' rather than 'forecast' the weather. Always enjoy your insights, Rigil. Yes, he really seems horrible lately. Regardless of snowfall predictions, the temperature predictions have been absolutely spot-on. It's been 33-36 the last 12-18 hours at my place in Roseville. You aren't going to get a ton of accumulating snow with those temps. Upper 30s the rest of the week. Good. Means I won't have to get out the roof rake and do that unfun business. Seems right that the NWS only went to an advisory, but if I recall wasn't that advisory going into effect at noon yesterday? Meaning it would have missed the most problematic part of the storm? NWS was an advisory for the metro the entire time. Winter storm warning was about 75 miles west of the metro. Several things about this storm just didn't sit right with me from the get go. First of all, the overall track of the low just wasn't one that was very favorable for the metro to get a good dose of snow. With a system passing nearly overhead, you just can't expect there to be a large amount of snow with it. Although the higher moisture amounts may have been forecast to come up through south central Minnesota up towards the Twin Cities, the temperatures on the surface, and aloft, weren't very favorable for good dendrites. Something that really stood out to me was typically when you see higher dbz in a radar return and it is on the fringe of shifting from sleet to snow, that the change over happens fairly rapidly due to dynamic cooling. The change over just didn't happen. Another thing that bothered me was that I never felt like the models were bringing up enough warm air with the storm, especially given the track of it. Forecast models have always seemed to struggle with that warm nose that gets wrapped into lows. Locally, yes the storm under performed. A few degrees colder and it would have been a complete mess. The bullseye of the system always was out in southwest Minnesota into South Dakota, and that's where the bulk fell. So, that was a good call. Further east from there though, it dropped off quickly. With the cold air still bottled up well into Canada, the lull for storms will remain. We may start to see a cool down as we get towards the middle of the month, but I'll believe that when I see it. As I said a while back, those who are hoping for a white Christmas may end up being bummed out this year. Those of us merely hoping for winter, let alone a white Christmas, are already bummed that it likely will not happen. Might as well refocus and see if we can get some 50 degree temps back in the forecast. Heck, let's shoot for 60 or 70 degrees. That seems more realistic at this point than the arrival of winter weather. What really bums me is that now I will have to mow the lawn throughout the next 3-4 months when I was instead looking forward to shoveling snow. As the Cubs say, "There's always next year". Come on La Nina!! Exactly. As a snow lover myself I had written this winter off a few months ago. You always hope you were wrong: unfortunately I was right. And it's not just about a white Christmas. I really think we are not going to have any consistent white at all. Can't wait til we have a white Christmas. Also gotta love self proclaiming "I was right" 3 days into meteorological winter. @Anonymous 12.13pm: I will refrain from responding to your sneaky and incompetent remark to keep it nice and avoid irritating Bill. Accuweather has us staying near 40 degrees or in the 40's the entire month of December, with one or two exceptions. I hope they are wrong. How accurate is Accuweather? Not accurate at all....look at it tomorrow it will be all different. My favorite kind of December! An interesting shift in the overall pattern just may give those hoping for a White Christmas a glimmer of hope. A couple of the oscillations are heading negative, which would finally allow some colder air to shift south and into the US. Models have been fairly consistent with the overall pattern of bringing a trough into the western US, and moving it east through the end of next week. Again, a good pattern for those who want snow. Of course, a majority of it depends exactly how things set up. This is a ways out there, so it is just more something to keep in the back of your mind as we go through the next 7-10 days. I read that the "cool down" predicted for later this month is still going to result in temperatures above normal, just not so far above normal as now and next week. Maybe January will bring us temperatures within 10 degrees of normal. No ice fishing this season. My family and I have started a new tradition most of the past several winters: kickball on Christmas afternoon! Hopefully this Christmas will allow for it again like last year. I'll be in California, but I'll drink to Minnesota kickball on Christmas! Cheers! This weather is awesome. Heck Bill may even move back to enjoy balmy weather! Year around water skiing. Indeed! Most days the last month have been in the fifties with much less sun than last year. The difference between the weather here and in MN has been pretty minimal. New record warm daily minimum of 38 set yesterday. Old record was 36 in 2001. That's a day I won't soon forget. I wore shorts to work because it was 63 when I woke up, but it was in the 30s by the afternoon. Very windy, wild day as I recall. You will hear alot over the coming days about a pattern shift and colder air moving in by the weekend and into next week with more "active","stormy","interesting" weather. Don't believe the hype!! Yes it will get cooler but compared to where we are it will drop down closer to average and aside from some flurries or light snow that may leave a cosmetic coating the metro area will not see anything significant, that's reserved for places east and south of the metro. Sorry snow lovers time is running out on your white Christmas maybe Santa will surprise us with snow days before the holiday. Man reading Dave Dahl's blog tonight you would think a lot of snow is coming and he pretty much guaranteed a white Christmas. Then you read the NWS discussion and it feels like there is a ton of uncertainty heading into this weekend and beyond. Its amazing on how certain Dave Dahl sounds. Bill maybe a new thread started to include Dave Dahls blog on what could be on the horizon, hope all is well out in California for you. DD is so irresponsible it drives me crazy. How can he virtually guarantee a white Christmas at this juncture, with these types of temps in the immediate forecast, and with hardly any other outlets predicting much snow at all? What a hype-driven false-hope-spreading snow monger. Woohoo, white Christmas coming, Dave Dahl says so, so it must be true he's been forcasting like over 30 years. It's remarkable what he comes up with. I'll set up a new thread, and count on you guys to make comments. OK, new thread gents (and gals).